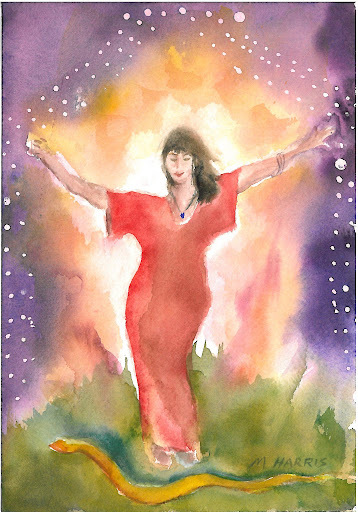 stories – We Are All Meant to Shine! It was in 1897 that Lizzie’s children got their first chance to go to school. The people of the community donated logs to build a 16 x 32 feet school house. Reverend L.D. Thompson donated two acres of ground on which to erect the building. It was covered with a dirt roof and was used not only for school purposes, but for other purposes by Mormons and gentiles alike. In the winter of 1896 Elder William Packard called a meeting of the Mormon people to discuss the proposition of building a meeting house. This building was completed by 1897. In this period when the Mormons were still in very poor circumstances the chief engineer of the Burlington Railroad came to A.O. Woodruff and told him that he would like to give the people of this area twenty miles of railroad to build. This section of railroad ran from Pryor Gap on the Crow Indian Reservation in Montana to Frannie, Wyoming. Contracts were signed for twenty miles of grading, the price being 13 1/2 cents for earth, 24 cents for solid rock, and 50 cents per ton-mile for pipe haul. Charles A. Welch, who wrote a history of the Big Horn Basin, was selected to do the railroad work and look after the commissary. This was an answer to a prayer as it supplied the settlers with a source of income during the winter. The next three years were quite good years on the ranch. They continued to clear more land, to improve the canals and to plant more each year. The crops of hay and grain were good, the family had a small garden, which Lizzie took care of. The children picked wild berries along the river. Some jelly was made and preserved. The children would collect old beer bottles and such. The tops were cut off the bottles by dropping a hot harness rind down over the bottle neck. Then they were filed smooth across the top. After they were washed and the jelly was poured and set, they were sealed by coating a piece of tablet paper with egg which and sticking it securely over the top. Lizzie was a thrifty woman and made use of all the items of produce. She made tomato preserve and a large stone jar was made full of pumpkin butter. The children love the green tomatoes that Lizzie used to slice and fry. After their lean years it now seemed that they had a very comfortable life. Lizzie’s daughter Florence gave birth to her second son on July 12, 1898 and named him Earnest John Prettyman, after her brother. In the winter of the following year on December 18, 1899, Lizzie and her husband Rollins Don Carlos had another son and named him Bartley Roberts Shepherd. Lizzie’s oldest son Earnest Wiggett was now nineteen years old, son Carl Shepherd celebrated his fifteenth birthday on January 1, 1900, and Laffe was fourteen. Son Claude wrote in a story, “I was big enough then to go with my brothers to get timber.” The boys cut and hauled many loads of logs and started to build a four room house. They laid logs up to the square (ready for a roof) at least two different times, the took the logs down to use for fences and corrals. One day while they were working on the fence, Carl picked up a new hatchet that one of the neighbors had carelessly left. New tools were rare, and Carl was pleased with his new find. Lizzie saw him hide it in the sagebrush and knew it did not belong to them and made him return the hatchet to the rightful owner. In the early spring of 1900 Florence and Burton Prettyman had their third son. Burton Hazen Prettyman was born in Burlington on March 27, 1900. In the fall of 1900 there was a lot of illness. A man by the name of James Aaron Kinnamin came to Burlington. He had left his wife and small child in Colorado, but had brought his four oldest children with him in a covered wagon. Lon and Willard were in their early teens, Mary about twelve years old and Howard about ten. When they arrive Lon was ill with diptheria. Lizzie took in the washing for this family and although she used carbolic acid as a disinfectant in the wash water and in the dish soap, soon Earnest, Valie and Lizzie each had diptheria. They were all very sick. Lizzie sent Carl to buy a bottle of pure grain alcohol at the saloon. She would pour a few drops of this onto a teaspoon with sugar and have the ill ones take it to cut the phlegm in their throats to keep them from choking. Addie was then about seven years old and was very afraid of getting the illness. She told her mother, “If I get it, I’ll die.” So she ate sugar and alcohol, and also threw all the used spoons behind a chest of drawers. Fortunately she did not get sick. Rollins Don Carlos Shepherd had his seventieth birthday in the winter of 1900. He continued to work on the ranch with the help of Earnest and Carl. They were still clearing sage brush and still extending the canal system across their land. In the year of 1901 they had a good crop of alfalfa that grew as tall as a horse. 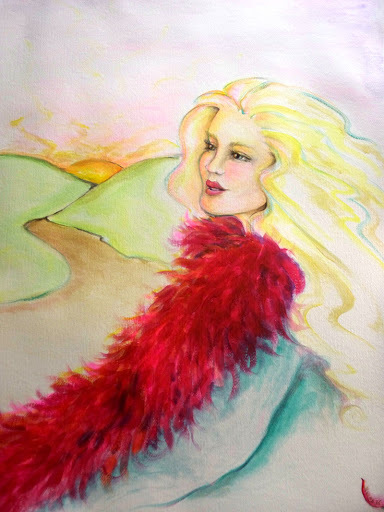 In the fall Laffe and Claude walked about three miles to school. Enda, Addie and Valie also walked to school with them. Valie can remember taking a short cut through the fields and down along the big canal. Sometimes they would go over to the Kinnamin house with Mary for lunch. They had rented a small house in Burlington. Although they had no woman to care for them, the house and the children were neat and clean. The children enjoyed these growing up years, and many family stories come from this time. 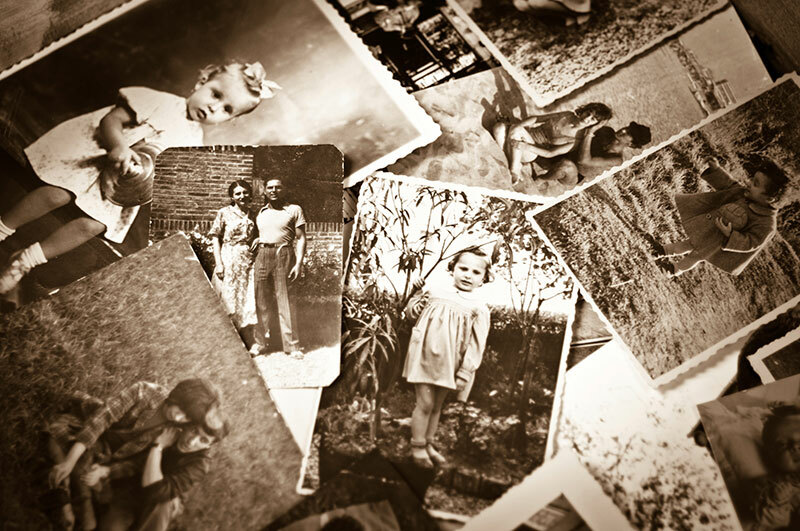 Do you know any old family stories? How far back do they go? Consider asking grandparents, parents, aunts and uncles about stories they may know. 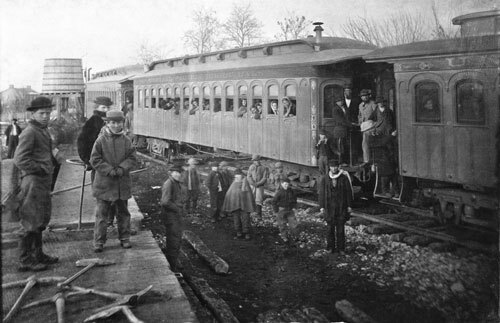 Lizzie, her two children Florence (age 4) and Benjamin Earnest (age 2), sister Lucy and brother-in-law Fred Fields, after arriving in New York, continued their journey west via train. They rode in boxcars on rough wooden benches with other immigrants to the Salt Lake Valley. 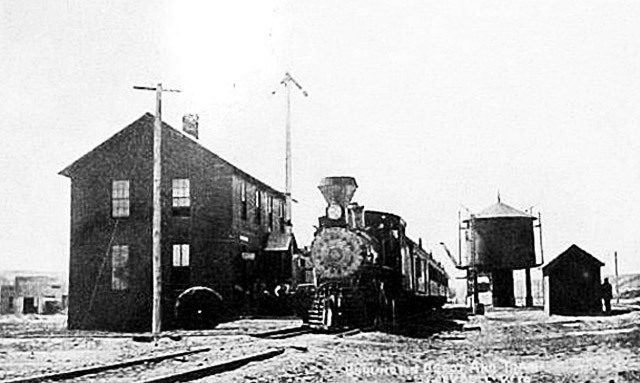 Later they took another train to Milford where they were met by members of the Roberts family from Beaver, Utah. A small house was found for Lizzie and her children and it was here, on October 22, 1883 that she gave birth to another son that she name John Wiggett after his father. Lizzie delivered the child herself and the child lived only a few days. During the fall and winter Lizzie received several letters from her husband John Wiggett, who had remained in England. She kept the letters in a coffee can for many years. Copies of the letters were preserved by her family. 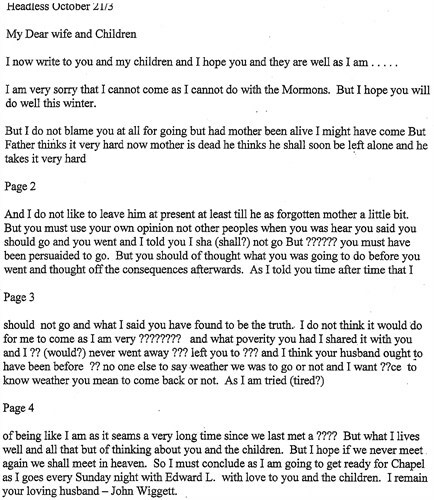 Below is the first page of a letter John Wiggett wrote to Lizzie in October 1883. It was four pages long. This is followed by a typed version a family member prepared. 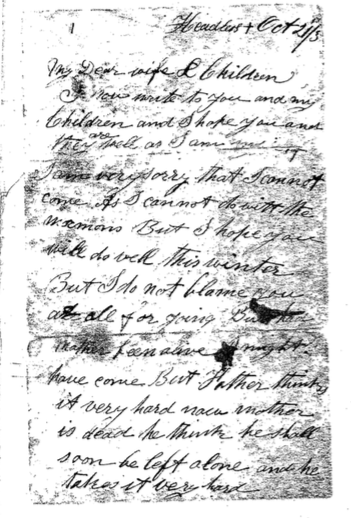 Typed transcription of John Wiggett’s letter to Lizzie. It soon became necessary for Lizzie to find work to support herself and her children. 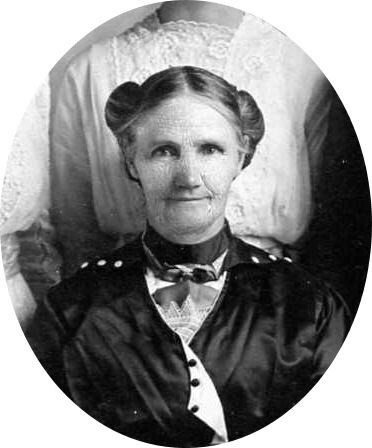 She went to work as a housekeeper for a man named Rollins Don Carlos Shepherd who lived in Beaver, Utah. He had been born in Cleveland, Ohio on December 8, 1832. He was thirty years older than Lizzie and already twice a widower, having been married to Sarah Smithson and then to Sarah Harris. About 1870 he lived in San Bernardino, California where he acquired property which was lost through lawsuits. He then moved to St. George, Utah where it is believed he worked on the building of the temple. 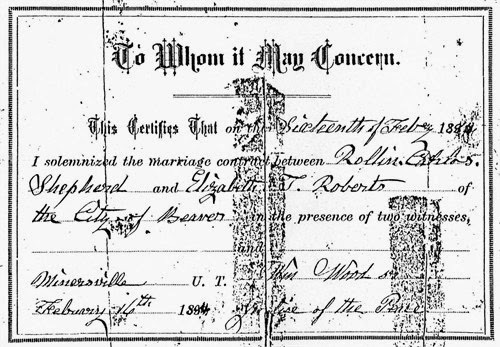 Lizzie and Don Carlos were married at Minersville, Utah on February 16, 1884. He was 53 years old and she was 23 years old. On January 1, 1885 their son Rollins Don Carlos II was born in Beaver, Utah. Although it is believed that Rollins Don Carlos Sr. had children from a previous marriage, it is thought this was his first son. On December 16, 1886 their second son was born. He was named Marcus de Lafayette after his uncle, the brother of Rollins Don Carlos. His brother Marcus was also a resident of Beaver, Utah during this time and had established a store and mill. From 1869 Marcus served many years as Bishop of the Beaver First Ward. Marcus was six years older than Rollins Don Carlos and they were very close. During these years the church was still colonizing in many areas. Families were often asked to volunteer to go into new areas and open them up for future expansion. Early in the spring of 1888 Rollins Don Carlos Shepherd, Lizzie and their children moved to Vernal in the Uintah Basin of Eastern Utah. The family spent about five years farming in this area and accumulated quite a few cattle. 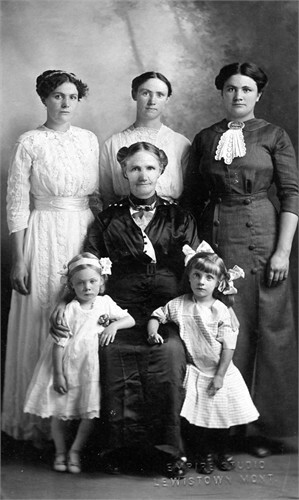 During this time three more children were born to Lizzie and Rollins Don Carlos, Claude Ashley Shepherd born June 18, 1888, next Electra Shepherd born November 23, 1889, and then Edna Shepherd born December 9, 1892. They established a good home and had cattle and horses.